Founder of The Prospecting Expert, Steve Kloyda has been creating and refining unique sales prospecting and selling experiences for more than 30 years. Steve began his sales career as a stockbroker in 1980 with no prior sales or business experience. With his distinct advantage of a Fine Arts background prior to becoming a stockbroker, he blended his right-brained creative problem solving and left-brained strategic approach to getting in the door and closing sales with phenomenal success, setting company records in as little as 8 months. Steve realized that other salespeople could benefit from the proven success of his unique sales and prospecting approach, leading him to combine his love of sales and his innate creative talents, founding Telemasters, Inc. in 1990. He developed a weekly coaching program working one-on-one with salespeople, utilizing a hands-on approach to prospecting, sales call refinement, communication and feedback – developing salespeople who consistently delivered superior results. (Steve utilizes his love of art by drawing his own illustrations to go with each weekly podcast or blog post). At Telemasters, Steve developed a unique process for transforming the outcome of every sales call, based on attention to superior customer experience, effective communication and building prospect and customer trust, generating consistently more sales. After twenty successful years of teaching and coaching salespeople in a variety of industries under the Telemasters brand, Steve recognized that the tools for sales and prospecting had evolved and renamed his company as The Prospecting Expert in 2010. Today, Steve Kloyda’s comprehensive and ever-evolving prospecting strategies are presented to thousands of sales professionals annually. His fresh approach provides his live audiences and coaching clients timely, relevant, effective and foundational tools for their sales and business success. Facilitated more than 6,000 one-on-one coaching sessions. Empower salespeople to do their best work. Act Now! 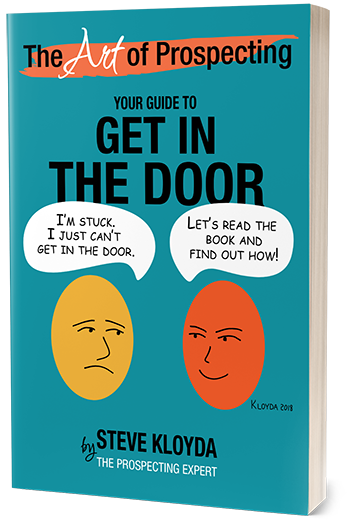 Connect with Steve today to get your foot in more doors, transform your sales results and dramatically grow your business!